There are no photos with those IDs or post 11938 does not have any attached images! 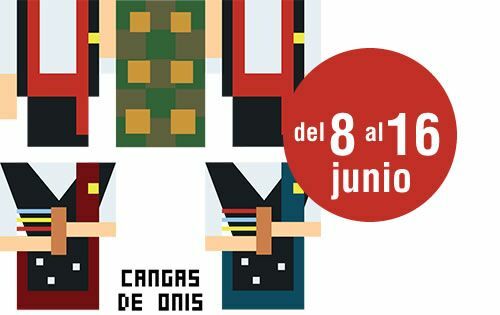 The festivities of San Antonio, in Cangas de Onís, will start the June 8 with the reading of the proclamation, by Celso Fernández Sangrador, «El de La Sifonería». The event will take place at 20 h. in the afternoon, at the Teatro Colón, and in the course of it will proceed to the presentation of the queen and bridesmaids of the parties. A host of events for adults and children will happen over a week. To enjoy! 19: 00 h. Parade of pipers, giants and big heads. 20.00 h. At the Cine Colón "The Proclamation" by Celso Fernández Sangrador. Presentation of the queen and bridesmaids of the parties. Performance of the Folkloric Association Picos de Europa, Band of Bagpipes, Children's Choir of the Municipal School of Music and Coro Peñasanta, presentation by Angel Lueje. 23.00 h. Verbena in the Robledal of San Antoniu. Orchestra Azabache, Avalle Van and DJ. 19.00 h. Dance in the Plaza del Ayuntamiento with Lando and his orchestra. 18.00 h. Parade of pipers, giants and big heads. 00.00 h. In the Robledal of San Antoniu "La Joguera". One hour nates begins the festival with the orchestras Los Satellites and D'Moda. Thursday day 13 "San Antoniu"
10.00 h. Mass in the Chapel of San Antoniu. 10.30 h. Descent of the Santu in procession to the parish church of Santa María. 12.00 h. Solemn Mass sung by the Peñasanta Choir. 13.00 h. Procession of the Santu to its chapel in El Robledal, accompanied by the bagpipe band City of Cangas de Onís. Auction of the Ramu and Burning of the Xigante. Vermouth session with The Da Silva Group. 18.30 h. Pilgrimage with The Da Silva Group. At nightfall, the beginning of the Verbena with the Marbella Light Show and Claxxon orchestras. Friday 14 day "Children's day"
19.00 h. The Tato show. 23.00 h. Verbena in the Vega de Contranquil, next to the ship of the old bakery: Fourth Street and Dj. Saturday day 15 "Great verbena"
19.00 h. Parade with the charanga The Team A. 23.00 h. Verbena in the valley of Contranquil, next to the ship of the old bakery: Olympus and Assia. Sunday day 16 "La Jira"
12.00 h. Parade with the charanga The Team A. 17.00 h. In La Vega de Contranquil, the distribution of the bollu and the wine bottle for the members. Dance throughout the afternoon in charge of the charanga The Team A. 22.00 h. Verbena in the Contranquil Vega: Philadelphia and Fourth Street. 00.00 h. In the Roman Bridge Los Fuegos by Pirotecnia Pibierzo SL de León.